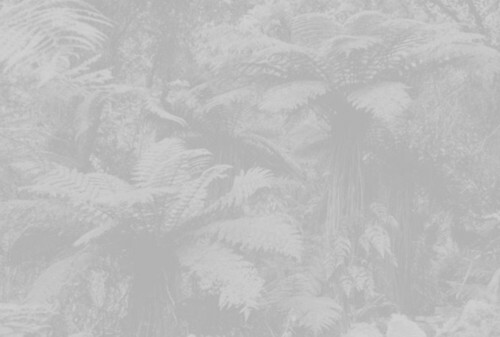 This species from southeast Australia is one of the least common Australian species in cultivation. Although perhaps slightly hardier than C. celebica (guessing around 22°F), to which it is closely related, it is usually considered inferior in appearance unless given plenty of shade, shelter and moisture which it requires. In such a position however it is very rewarding to grow since the fronds are very attractive as they expand: the stipes and pinnae expand first while each individual division on the pinnae remains curled up in a little ball for a while before finally expanding. 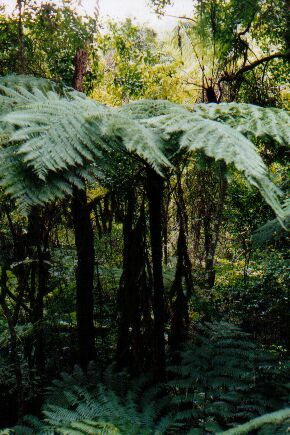 Cyathea leichhardtiana is tall and slender in stature and grows rather slowly, ultimately achieving a height of about 20' with fronds typically about 9' in length. Like C. celebica the stipes are covered with black spines. English growers report some difficulty in raising this species from spore. 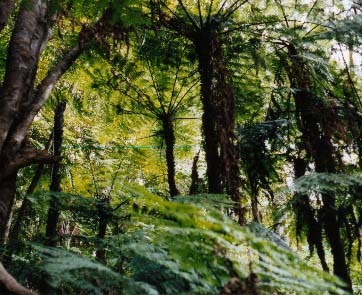 Cyathea leichhardtiana in habitat, photo courtesy of Keith Rogers, Mannum, South Australia. 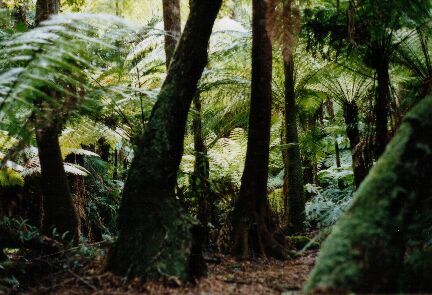 A shot of Dicksonia antarctica developing large butressed trunks, with three Cyathea leichhardtiana in the background at right. Photo courtesy of Keith Rogers, Mannum, South Australia.